What is really the best way to style colorful earrings? To answer this question, let’s take a little trip down memory lane. We are going all the way back to first grade. Remember that lesson about primary colors and their complementary colors? That’s a good starting point for styling colorful earrings. Of course, fashion is the most fun when you are taking risks. So, this won’t be an exact repetition of your lesson on colors. Read on for a lesson on how to style earrings like a pro. Now, envision the color wheel. Your first grade teacher probably taught you that the colors exactly opposite each other are complementary colors. You can stick to this rule when styling your colorful earrings too. Amethyst studs pop with clothing that has orange detailing. Bright pink hoops look fab with a light blue romper. Those turquoise danglers you bought in Greece stand out against a yellow wrap dress. Wearing colorful earrings with clothing that are the opposite on the color wheel is a guaranteed way to grab attention. This is the way to go if you live for that spotlight. Some might say it’s a risky fashion choice but it’s a risk that will pay off. On the other hand, if too many colors scare you, these suggestions may have given you a heart attack. It’s definitely out there. 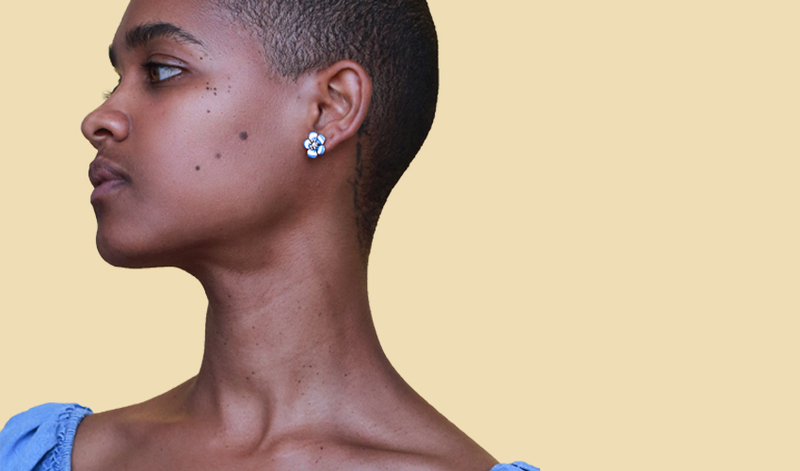 Rest your heart, this isn’t the only way to wear colorful earrings. Another styling option is to carry through the colors in your earrings with the colors in your clothing. This option works especially well when your earrings are multicolored. Take one of the colors in the earrings and bring that back in an item of clothing. For example, a drop earring of rubies, amber and diamonds looks glam with a killer red dress. Attention please, femme fatale coming through. Or, wear a single multicolored statement earring with a pantsuit in one of the colors of the earring. Just to be clear, the pantsuit we are thinking of is not the standard, black, gray or blue. Who said androgynous looks have to be in basic colors? If you want your earrings to be the focal point in your outfit, then wear blacks, whites and gray shades in your clothing. In this case, your clothing acts like a canvas for your colorful earrings. The coolness of black, white and gray complements warmer bright colors like yellow, red, pink, purple and orange. Try a bright colored tassel earring with your gray office dress. Freshen up a white tee and black shorts with pink and orange earrings in a fun shape like ribbons or parrots. For this styling, stick to these three basic colors for the clothing. Let the color be exclusive to your jewelry. You can continue the colors in your earrings in your other jewelry. Since your outfit sticks to the basics, your completed look won’t look too busy. Some women are afraid that wearing colorful clothing and jewelry reads as junior. You don’t have to worry about this if you style your jewelry the right way. We recommend pairing your colorful earrings with other jewelry pieces that are yellow or rose gold. These warm gold colors balance out the bright colors in your earrings which makes the look classier. To match the gold jewelry pieces with the earrings, try to find other common elements. Look at the shape of the earrings, the material and the methods used to work the material. These are all elements aside from color that you can bring back in the other jewelry pieces. You can also translate the vibe of the earrings into the other jewelry pieces. Maybe the earrings are very boho chic which works with a wide cuff bracelet worn higher on the arm. Or maybe the earrings have a nineties vibe which looks great with a choker. Our final styling tip is to truly commit to the color of the earrings by wearing a monochromatic outfit in this color. You will look like a real life Instagram picture but in the most fashionable sense. You can start with softer colorful earrings in pastel colors to ease into it. Once you feel comfortable with that, you can amp up the saturation. Who knows, you might make it all the way to neon colors. Colorful earrings are fun so don’t shy away from them. We love seeing classic pieces with a twist and color is a great way to do that. For more colorful inspiration, keep reading our articles on how to style jewelry pieces. 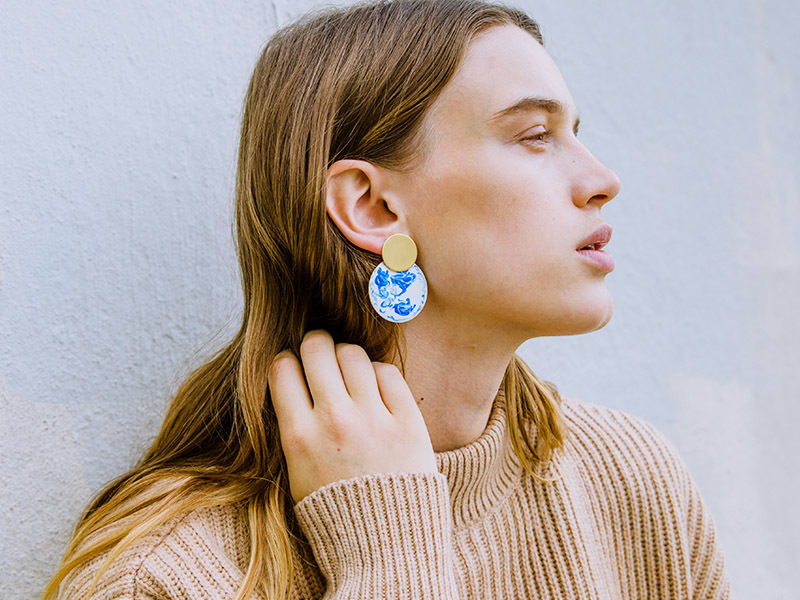 To check out the earrings in the article or discover more unique designer earrings, visit Ana Luisa online jewelry shop.